THE seeds were planted last year. Long before series eight, episode four. The one where Lucas North (Richard Armitage) and his past collide. And he also visits Waterstone’s bookshop in London’s Piccadilly. A store I know well. This is raw, washed out and brutal Spooks at its very best. My favourite episode so far this series. Tortured Lucas is forced to confront his demons when he meets up again with his Russian prison interrogator Oleg Darshavin. It’s a nightmare for him and a real dilemma for Harry and the rest of the team on The Grid. Especially when Lucas goes off radar after his visit to the book shelves. To seek out Oscar Wilde’s The Picture Of Dorian Gray. A book about duplicity and selling your soul. First we see him getting very close to CIA officer Sarah Caulfield. She of “Hairy Pearce” fame. Before a later glimpse of Lucas in what will forever be known as The Boiler Suit Scene. Ros (Hermione Norris) is also tortured – by having to shoot and kill Jo (Miranda Raison) in last week’s episode. Replayed in slow motion for those who thought we should have seen far more of Jo before she met her Spooks end. Hairy…sorry, Harry (Peter Firth) is also struggling with his feelings, having sent Jo to her death in that bunker. Bench chats aside, this is Richard Armitage’s episode. As he puts in a damn fine performance which keeps us all guessing. With a few twists – one of which I really didn’t see coming. Proving that even in series eight, Spooks can still surprise its audience. Or at least the vast majority who hadn’t already guessed. We are also treated to a brief and indirect mention of the recently retired Malcolm. *Spooks episode four is screened on BBC3 at 9pm tomorrow (Friday) ahead of its BBC1 transmission at the same time next Wednesday. Posted in Spooks and tagged Hermione Norris, Lucas North, Miranda Raison, Nicola Walker, Peter Firth, Richard Armitage, Spooks. Bookmark the permalink. Sarah Caulfield: Hairy hahahha don’t forget Ya’ll Ta (I mean Yalta)!! Those get me on the floor laughing a favorite amongst some of us in the States. Looks like we are in for a great episode 4. Oh, Harry and Ruth please it has to get better for them. Ian, Ian, Ian . . . I do so love your blog entry on Spooks. Sarah’s supposed American accent has this Yank scratching her blonde head – it’s like she was born here in the South where I hail from; went to a New England boarding school and made frequent trips to New Jersey to gamble . . . it’s all over the place! 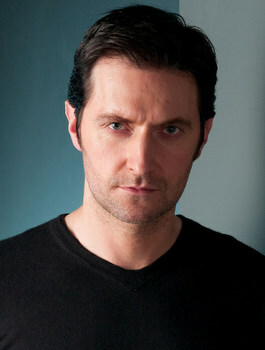 Having seen the previews for this week, I knew it was going to be pretty Richard-centric, which is just dandy with me . . . and how you have further piqued my already avid interest. Many thanks for mention of the Boiler Suit Scene . . . Thanks for mentioning Waterstone’s. I am always interested in anything bookish! And also for explaining the significance of “The Picture of Dorian Gray, I wondered about that! From a newbie American viewer- this Sarah Caulfield person doesn’t sound like any American i have ever met. and i’ve met a lot of them. Born in CA, college in TX, grad school in OH- never once ran into anyone who talked like that. It seems like it even borders on Australian sometimes. Well- that’s my 2 cents. Great series, needed to cast someone else as that character. I could watch Richard Armitage play opposite a giraffe and he’d still be insanely attractive. I managed to see season 7 and 8 online at various sites so I enjoyed the last two seasons since in the U.S. it can’t be found on regular cable or regular TV. I will miss Malcolm, but Tariq seems to be fitting in quite well. I hope they figure out a way to bring Ros back even if for an episode — I love the snappy dialogue between Ros and Lucas. I am assuming they will kill off Lucas in Season 9 since it seems 2 seasons as the ‘lead’ male and you get killed off or ‘retire’. I am hoping they have some IRA stuff come up — then Harry P. can face some of the issues Tessa brought up in the early seasons of the series.